At the RedShed, we offer a comprehensive range of chainsaws available in Melbourne that are sure to meet all of your cutting needs. If you need a lightweight model for just working around the home or a more powerful one for a larger property or farm, you will be able to find the best option in one of our showrooms. 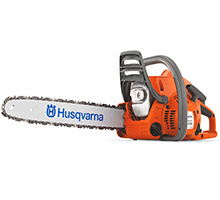 We are able to supply you with a high quality and world leading Swedish made Husqvarna chainsaw, as well as a range of Chinese and Japanese made models. We encourage you to discuss your specific needs with us so that we can help you determine which machine will be best suited. Melbourne’s Mower Centre understands that there are a number of professions that require the use of a reliable chainsaw, including arborists and professional loggers. This is why we stock a range of handyman and commercial models that are sure to meet your demands with ease. When working around the home, we are able to supply you with a range of electric chainsaws in Melbourne that should meet your needs nicely. These are a more affordable option for many people and provide adequate power for keeping an unruly backyard under control.